The Last Rector at Penshurst? 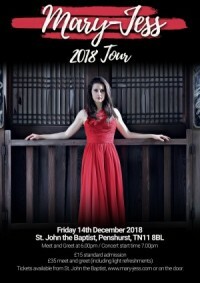 For those of you who were lucky enough to hear Mary-Jess’ concert last December, you will be delighted to hear that she is to return on Friday 14th December for another concert in Penshurst Church. Mary-Jess: the English, Chinese speaking, soprano who paints in sound the colour of human emotions and touches hearts across the world. Whilst studying Mandarin Chinese in China, Mary-Jess won ‘The Chinese X Factor’, a TV singing contest with a live viewing audience of over 70 million people. Shortly after, she released her debut album ‘Shine’ with Decca, which won numerous awards. Mary-Jess was chosen to sing the Downton Abbey theme song for the Official Soundtrack albums, bringing the number of albums she has featured on to 14 so far, not including her three critically acclaimed album releases. She has performed with Sir Tim Rice, Blake and Don Black, toured with Russell Watson and The Kings of Popera: G4, sung to Royalty in Windsor Castle and she was asked to sing ‘Abide With Me’ at the FA Cup Final in front of a live audience of 90,000 people and a worldwide TV audience of 300 million people. After performing at The GREAT Festival of Creativity in Shanghai, Mary-Jess was invited to Number 10 Downing Street where she was asked to represent UK music as an ambassador for The GREAT Britain Campaign in 144 countries around the world.